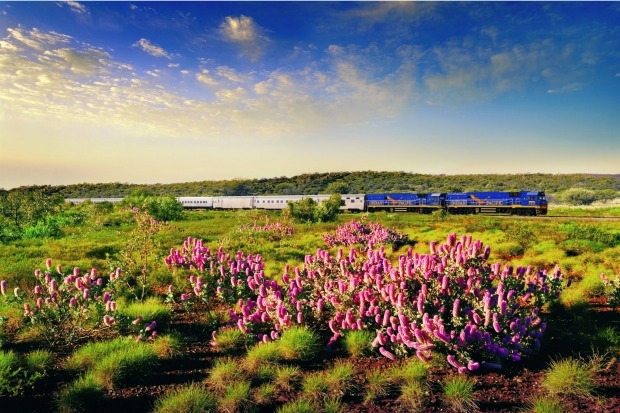 The Indian Pacific on passes wildflowers on its 4352 kilometre route between Sydney and Perth. 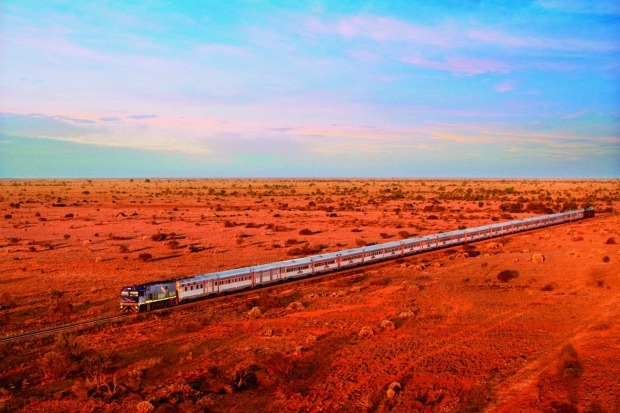 The Indian Pacific makes its way between Australia's eastern and western seaboards on its 4352 kilometre journey. 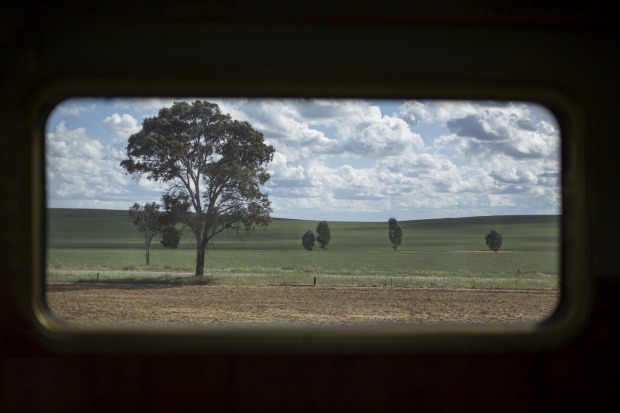 View through a carriage window of the Indian Pacific of a Broken Hill "slag heap" on which a miners' memorial is located. 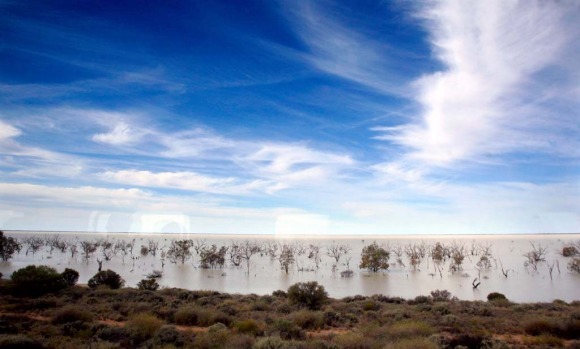 There is something mystical about travelling the outback on a train. 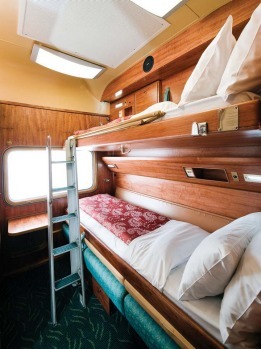 A gold class cabin on board the Indian Pacific after the sofa has been transformed into bunk beds. 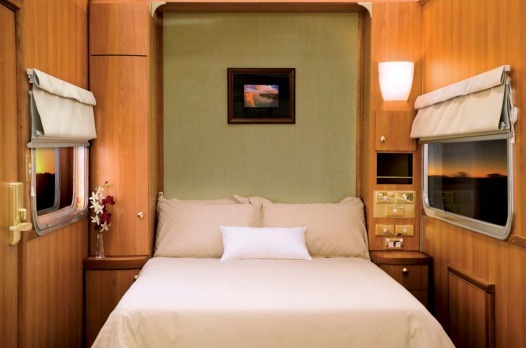 A platinum class cabin on board the Indian Pacific. I'm aboard the Indian Pacific, careering through Sydney's prosaic outer suburbs, rendered strangely attractive in the diffused late afternoon, and feeling rather pleased with myself at having embarked on one of the world's genuinely great rail journeys and one of the few to span a continent. 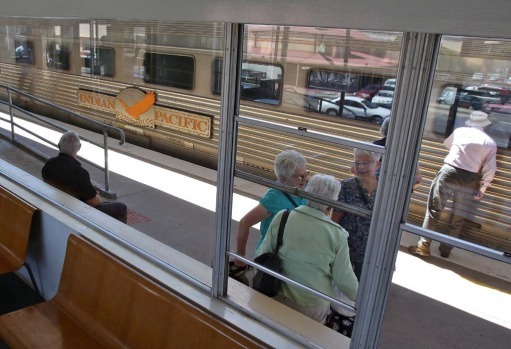 Yet in a visual metaphor for many Australians' odd indifference towards long-distance train travel, I notice that inside a double-decker commuter train converging with us, there's scarcely a hint of interest in the Indian Pacific, its wedge-tail eagle symbol on the side of each carriage. Except for one man transfixed on the train and a child waving to us, the rest of the passengers are dozing or absorbed in their iPhones, iPads or the odd book, newspaper or magazine. 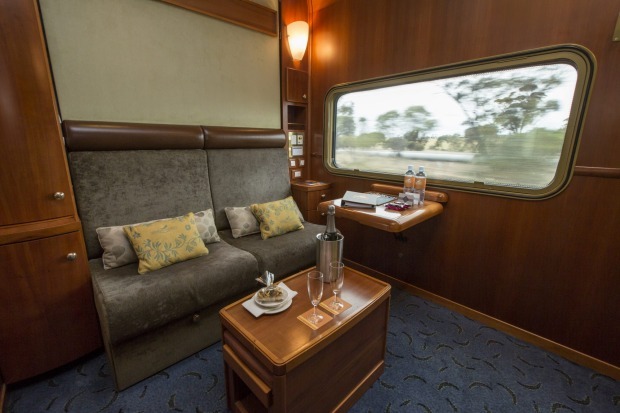 But, damn it, nothing, as I get stuck into the soft and hard cheeses and fine South and Western Australian wines in an Indian Pacific lounge car, including commuter apathy, is going to dampen my enthusiasm for this journey. 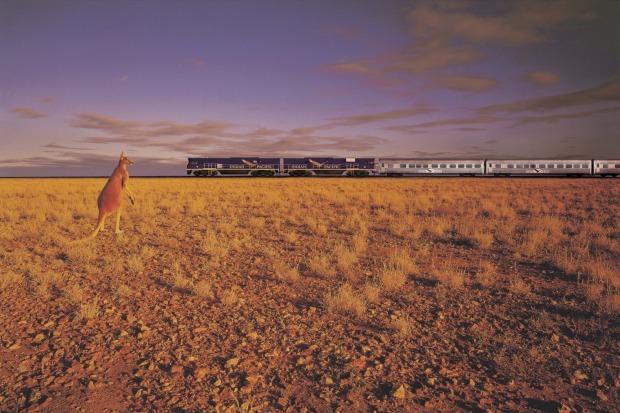 It is, after all, more or less 25 years since I wrote a book, Ribbons of Steel – Riding the Indian Pacific, with photography by Ross Bird, to mark the 21st anniversary of the Indian Pacific. The book was so well received it's taken the operators of the Indian Pacific all of two and a half decades to invite me back aboard the full journey (no hard feelings, Great Southern Rail). 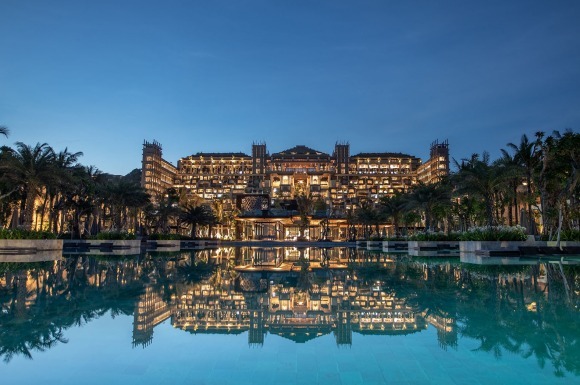 This is going to be a walk – make that one helluva ride – down memory lane. And some lane it is: the total distance between Australia's two seaboards is a whopping 4352 kilometres, making it the ninth-longest rail journey in the world, pushed down the top 10 list in recent years only by new Chinese train journeys, such as the 4980-kilometres trip between Guangzhou and Lhasa. After all the years since last travelling on the train between Sydney and Perth I'm eager to see what, if anything has changed. I'm perversely pleased to discover that, apart from the crew, I'm still one of the youngest passengers on the train. 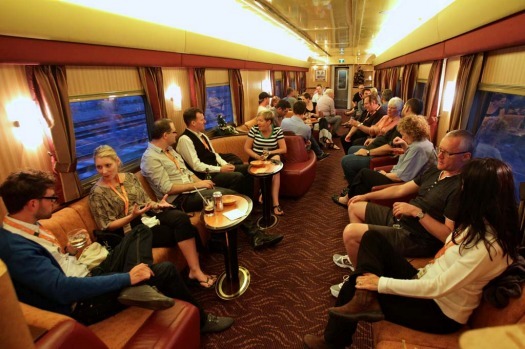 Since I last journeyed on the Indian Pacific, airline-style classes have been introduced. I've been granted a berth in the train's Platinum Class, which gives me access to an exclusive lounge and dining car which comes with a fully-stocked, partially self-service bar and espresso machine (but you still get a knock on your compartment door each morning from the room attendant to deliver the traditional cuppa). 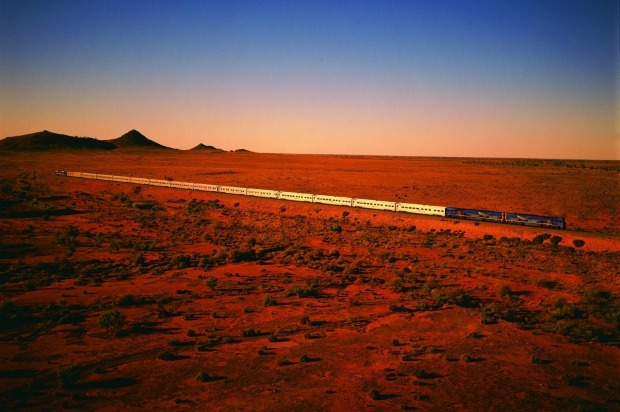 Back when I wrote Ribbons of Steel, there wasn't anything espresso about the Indian Pacific - coffee and track speed included – with staff wearing crisp white shirts and natty black bow ties, even out in the middle of the Nullarbor when refilling the Indian Pacific's water-tanks. 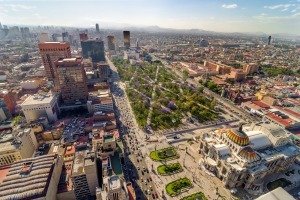 It's all a lot less formal now and it's also a much better, more contemporary train, even if it is as slow as ever with an average speed of 85 kilometres an hour. Then again, with a host of comforts, stunning scenery, fine food, wine and coffee, and a self enforced "e-tox" along much the way, what's the rush? 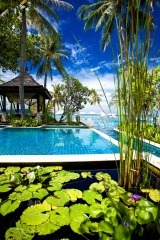 Sit back and savour it, for goodness sake, I say. 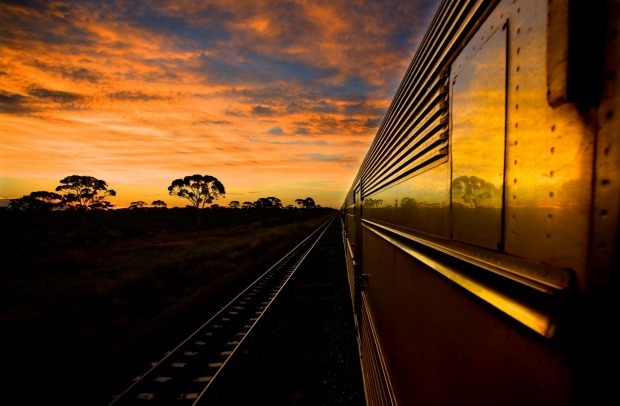 Before you can say "more camembert, please, conductor", the Indian Pacific has shed Sydney's outskirts,and is snaking its careful, meandering passage high above the deep, densely-vegetated valleys of the Blue Mountains, its famous sandstone escarpments tinged orange by the setting sun. The train sweeps through quaint heritage railway stations with neatly-tendered gardens and plunges in and out of tunnels that are so long at times, they preview the looming evening aboard the train. By dusk we've shed the mountains and we're on the straight and narrow, swallowing up towns such as Lithgow, Blayney and the intriguingly-named Orange East Fork on our relentless trajectory to Broken Hill. The Indian Pacific heads in to the night with only the headlights of the train and the moonlight to illuminate those ribbons of steel and then it's time for the dining car. 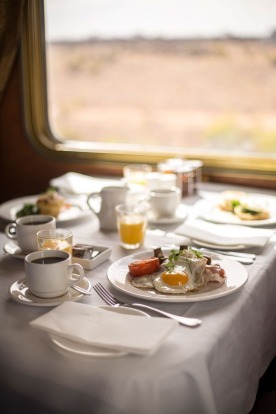 Nothing, in my book, is more convivial, or civilised, as a dining car on a long-distance train, even though tonight the atmosphere is slightly and amusingly tempered by a nearby table of four who are comparing their medical experiences of a bowel-rated nature. I try and concentrate on the view, only to discover that it's disappeared with the night, the window leaving just a reflection of myself, looking a just a teeny bit older, I have to concede, than when I wrote Ribbons of Steel. 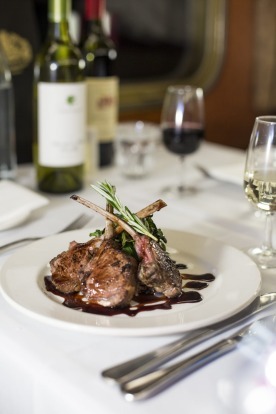 The cuisine on the Indian Pacific, most of which is cooked fresh in the tiny confines of the onboard kitchen, is excellent, skilfully prepared and presented, well-portioned dishes with a hint of bush tucker-style flavours, as befitting the journey. 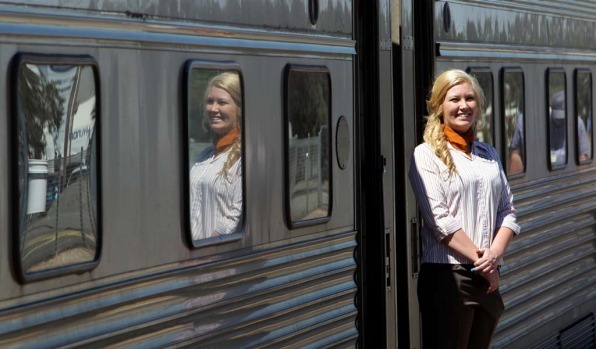 They come with descriptions nearly as long as the 774 metres average length of the Indian Pacific itself, namely "slow-cooked lamb with Kangaroo Island ligurian honey and black vinegar served with pumpkin puree, apple and celery slaw" and "grilled swordfish fillet served with puy lentil and romesco sauce". I'm particularly impressed that the lamb is cooked appropriately pink – another welcome change from when I last travelled on the train, when grey, in the tradition of old-style Australian cooking, would have been the preferred colour for such a meat. When I finally retire to my compartment I'm greeted by a glorified though cosy and ingeniously-designed cupboard with twin beds (doubles are also available these days), hidden from view by day and lowered for slumber by night. 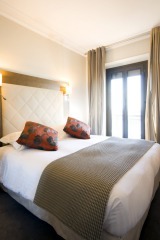 There's a small though highly-functional ensuite bathroom with a water flow from the shower rose, I'm delighted to discover the next morning, superior than some motels I've stayed in over the years. In the dimmed light I can see that a nightcap of Baileys Irish Cream has been supplied by the room attendant on a slimline bedside table. Lulled, eventually, by the unsubtle rhythms of the train, which at best can tend to feel a little like being inside a Whirlpool on the delicate cycle until you become accustomed to them, I fall asleep in some Baileys-induced happy place or other on the fringe of outback NSW. Fearfully early the next morning, with the first hints of daylight sneaking through the thin Venetian blinds inside the double-glazed window of the compartment, the Indian Pacific has delivered us to Broken Hill, the so-called Silver City which has lost a considerable amount of its lustre as its rich lead-zinc ore deposit has declined to near-nothing. It's winter when I travel and a fog has descended on this celebrated outback mining city with the wide streets at this hour deserted as we embark a true whistlestop coach tour. 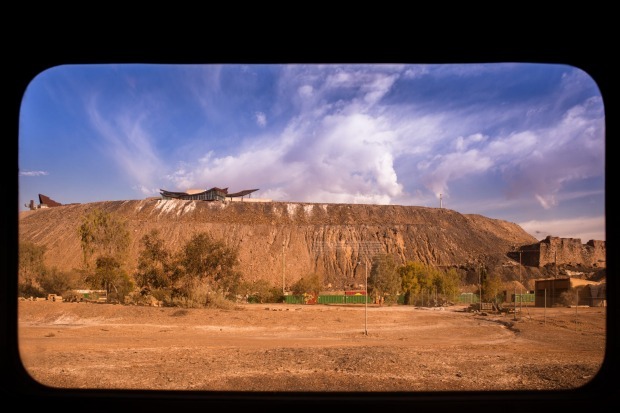 Eventually we make our away up into the real hills of Broken Hill – the stark massive man-made slag heaps formed from the dregs of mining over the decades. Here, as a crimson sun begins to finally bleed through the fog, is the moving Line of Lode Miners Memorial, dedicated to fallen diggers of another kind. It's no ordinary memorial, being an architecturally-striking, rusted steel monument to the 800 or so miners who have died in various accidents and mishaps. Beside each of the names are touching floral tributes which bear testimony to the fact that while Broken Hill's focus on mining may have diminished the city's memory of those who built it, they will never be forgotten. The tales of the myriad horrendous manners in which they died are as chilling as the weather this morning and it's a relief to return to the warm and safety of the train. We're back on the rails and heading to Adelaide though many of the passengers, me included, have elected to take an extended tour of the Barossa Valley, now not merely a major wine growing region but also a burgeoning dining and produce hotspot, before rejoining the Indian Pacific in the South Australian capital, six or so hours later. From the Barossa, it will embark on its journey back into the desert and out on to the Nullarbor and eventually on to Perth. I'm not sure what Maggie Beer was up to 25 odd years ago, and I am uncertain what the salt-of-the-earth passengers of the Indian Pacific back then would have made of her range that includes such delights as Sangiovese verjuice and duck, vino cotto and star anise pate. Then there's Artisans of Barossa, a swish cellar door representing seven boutique winemakers, and even the historic, Seppeltsfield Winery, as other stops on our highly-enjoyable excursion. The venerable Maggie Beer, in the true tradition of celebrity chefs and cooks at their own establishments, is conspicuous by her absence. But the large party from the Indian Pacific is warmly welcomed at her famed Farm Shop at Nuriootpa. After a potter around the shop, our group is ushered inside the function room for a fine two-course off-train dinner before heading to Adelaide to resume our journey. 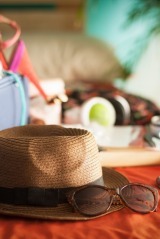 The next day the Nullarbor (a word derived from Latin meaning no trees) beckons. 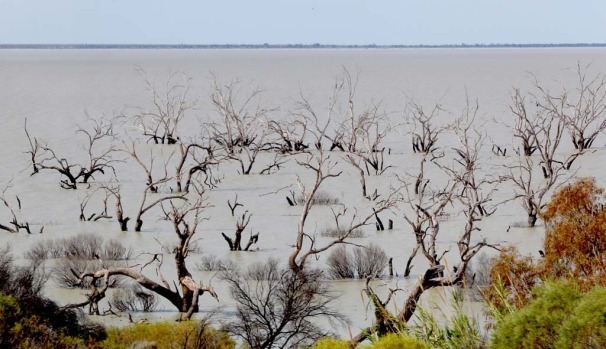 Twice the size of England, it's surely one of Australia's most misunderstood and underrated landscapes, dismissed as kilometre after kilometre of abject, rubble-strewn nothingness. 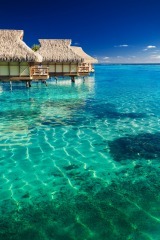 But, to me, it's always been that precise nothingness which makes it so fascinating. Incredibly, there is even less human habitation on the Nullarbor than when I last crossed all those years ago. 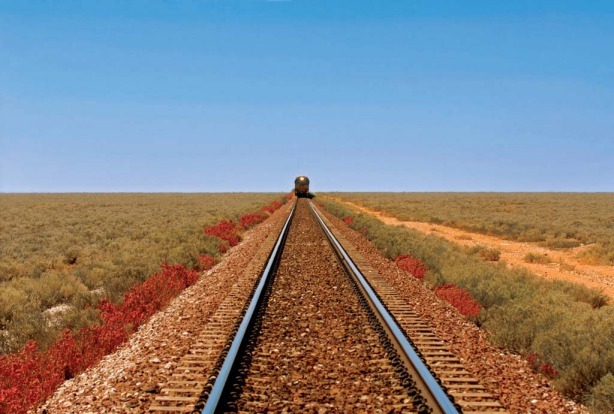 Back then, a railway settlement, Cook, was one of the few specks of human habitation between Port Augusta and Kalgoorlie, located on the world's longest stretch of track, all 478 kilometres of it between Ooldea and Loongana. 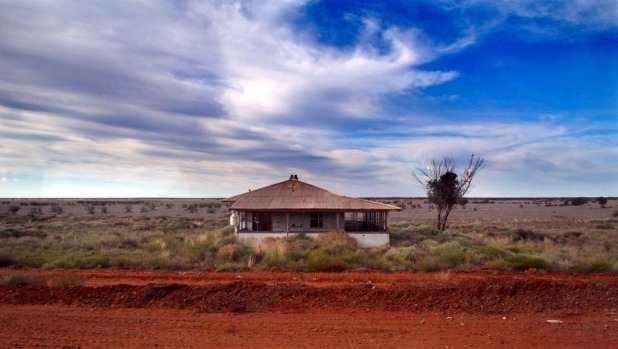 Now Cook, 1138 kilometres from Adelaide and 1523 kilometres from Perth, is deserted, having become a kind of Pompei of the Nullarbor, a place utterly frozen in time. Once the self-, and sardonically, described "Queen City of the Nullarbor" with a population that swelled to an all-time high of 200, Cook was an important base for maintenance and railway crews. Today it's merely a rest-stop for locomotive drivers, and where once there were signs asking visitors to not disturb the privacy of the residents, passengers are now free to wander around the deserted schoolhouse and a little like a scene from the TV series Life After Humans the swimming pool, tennis court and, yes, the golf course and clubhouse, have totally gone to pot. 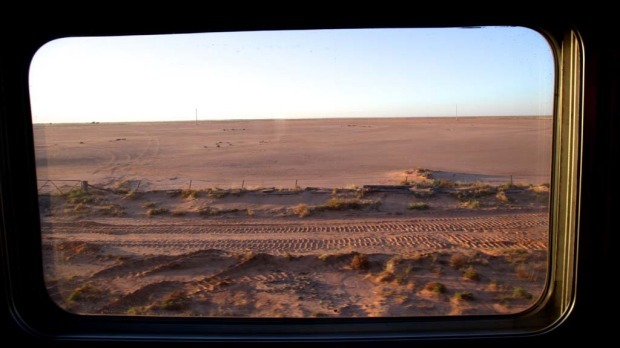 On our last full afternoon on the Indian Pacific, lonely caravans of camels (yes, that's what they're called) can be sighted creating their own wily-willies of dust as they move across the relentlessly flat stretch of land that is the Nullarbor. 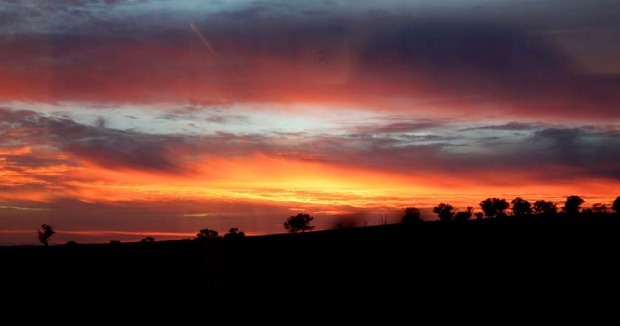 From inside the lounge car we watch as puffs of pink begin to populate what is surely the biggest sky of them all. 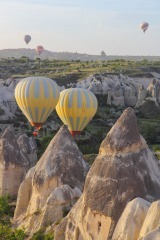 Eventually, most of it is enveloped in an intense, fiery, rose-tinged display that extends all the way to the horizon. It's a sunset the likes of which I've rarely, if ever, seen in my travels. If only those commuters aboard that suburban Sydney train three days or so ago now, could see us now. A train like the Orient Express may offer more luxuries and more glamour but I doubt that it could deliver such a natural spectacle as breathtaking as the one I've just witnessed. 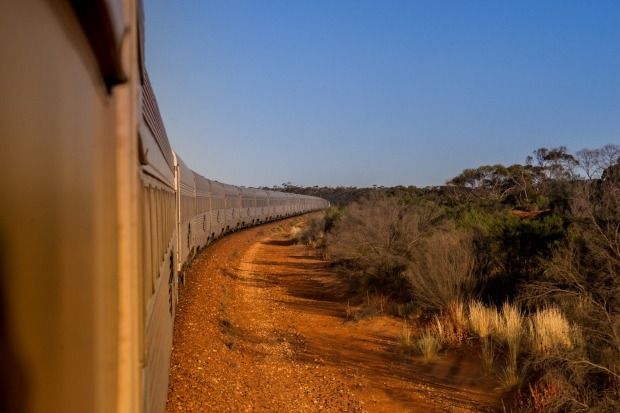 As darkness settles on the Nullarbor, the Indian Pacific pulls into Rawlinna, a railway siding named after the local sheep station, Australia's largest. 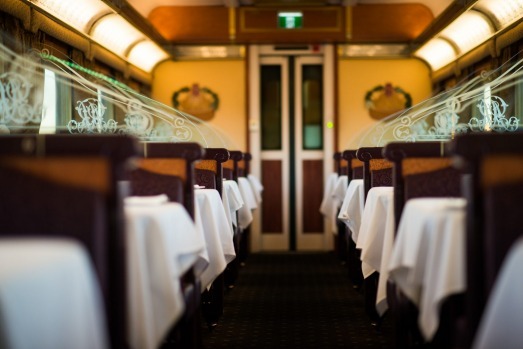 It's also the location for the newest feature of the Indian Pacific's itinerary, an al fresco feast of lamb on trestle dinner tables lined along the train by staff from the station with the light of the station, the moon, the stars and lanterns for illumination. 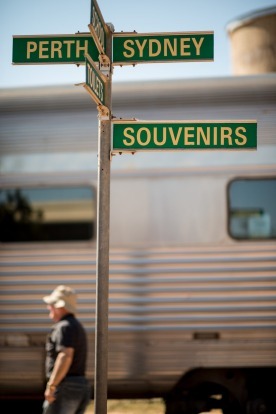 The station, which dates to the early 1960s, is home to more than 70,000 head of sheep with wool still sent to Adelaide for testing and selling and the train providing a lifeline to the distant outside world. The crew have set up speakers outside the train, pumping out Slim Dusty ditties as we dine and Maggie, the station dog, scurries under tables in excited anticipation of scraps. 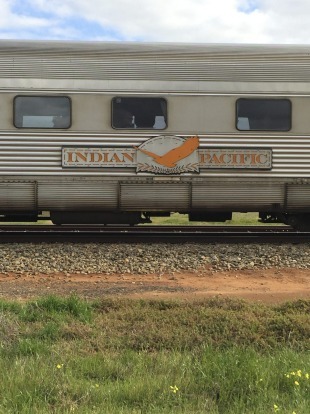 Slim was impressed enough by the Indian Pacific, recognising it as the great rail journey, to have penned an eponymous song about it. I was impressed enough to have borrowed the name of my book from one of the song's verses: "From coast to coast by night and day/Hear the clickin' of the wheels/The hummin' of the diesel/On her ribbons of steel/Carryin' the mem'ries/Of a nation built by hand/See the Indian Pacific span the land." 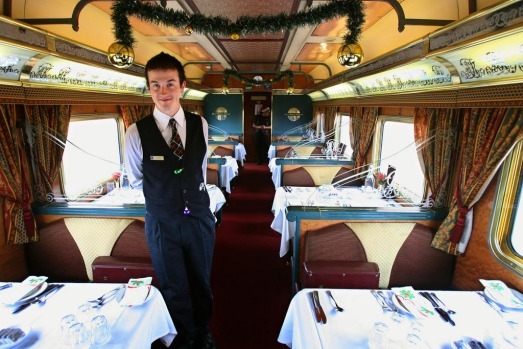 The writer was a guest of Great Southern Rail. 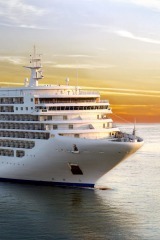 A gateway to the outback, including the magnificent Flinders Ranges to the north, Port Augusta is a long-standing road and rail centre at the head of Spencer Gulf. Major highways from all directions intersect here. Located in the desert country on the edge of the Nullarbor, Woomera is best known for its role as the nation's rocket-testing range. It's aptly named after an aboriginal implement used to increase the range and speed of a spear. Tarcoola, an aboriginal word for "river bend" and the name of the winner of the 1893 Melbourne cup, is an outpost in northern South Australia where gold was found at the end of the 19th century. After the gold ran out Tarcoola became a remote railway settlement. In 1893 fossicker Paddy Hannan struck gold on the edge of the Nullarbor, igniting an inevitable rush. His statue stands in the town's main street which leads to the four kilometres wide, modern-day "Super Pit" open cut mine which operates around-the-clock. Home to the annual Avon Descent, a two-day white-water race classic, the Avon Valley is located in the Western Australian wheat-belt 100 kilometres from Perth. Northam, York and Toodyay are towns through which the Indian Pacific passes on this part of its route.